Some of my kids have such a wide focus that they can’t focus on what I’m trying to ask them to do. Picture the amount of space I’m working with when addressing fine motor skills . . . it’s likely a small space, right? Read on to discover the 5 S’s of slowing down your fast-paced kiddo! With these games, you have to use your small, precise fine motor skills to turn and manipulate small pieces, and your visual motor skills to properly align them and place them into a toy. Place the motivating main game piece (piggy bank, cookie jar, etc.) on a higher level such as on a shelf, a table, a chair, a mat, a sideways cube chair . . . and then place the manipulatives (coins, cookies, etc.) on the floor or on a lower level or surface than that of the main item. This helps to create some space between the game pieces (coins) being manipulated (turned, rotated, shifted, etc.) and the main item (the piggy bank). Not only does this create a physical space, but also a visible space. By doing this, you expand the kiddo’s available work area. Rather than a closed, cramped space with the piggy bank at midline and the coins off to the side, you now have a fine motor manipulating area on the floor or lower surface, and then your more combined fine motor/visual motor integration area up higher for them to turn the piece, line it up, and place into the toy. Additionally, this adds a bit of a gross motor component to an otherwise “sit and fine motor” task. Now, there’s nothing wrong with sitting at a table with the piggy bank toy in front of your kiddo and coins all around them: some kids will do great with this presentation! However, here we’re talking about adapting activities for those who may benefit from a little movement or a change in scenery. As much as possible, I like to incorporate an obstacle course into my treatments. But for some of my kids with higher energy levels, this may seem more like a safety hazard than a good idea. Often times therapists will place an item at the start of the obstacle course for their kiddo to carry along with them. That’s great - you can tackle a lot at one time, but also wow - that can be a lot for some kids. Introducing: gross motor obstacle course goes wild! On that note, let’s talk about how to slow some down some of these fast-moving kids and increase their safety. Instead of having them pick up an item at the start of the obstacle course and carry it all the way through, I might place bean bags, cars, or other preferred toys to pick up along the way. If a balance beam is part of the obstacle course, I will place 1-2 items on the floor on each side of the beam (left and right). While my kiddo is walking along the beam, I ask them to bend down to pick up the item, keeping both feet on the beam. To do this, they to have to reduce their speed, slow their momentum, focus their motor planning in their immediate area, and carefully bend or squat down to get the item from the floor. We make it a game to try not to fall off the beam! Returning to standing, taking another few steps, and getting the next bean bag off the floor repeats this slower process. I’ve found this to be a fun way to challenge them, and to slow them down a bit, thus increasing the effectiveness of some of the components I want to address. Build in objectives for them. In my previous post on working with challenging pediatric patients, I write about how it can be fun to expand your “playing area” by incorporating something like a scavenger hunt. For a kiddo who has a difficult time focusing: Completing a single fine motor task. For a long period of time. In one little area. May seem like an impossible feat. At my clinic, we have a couple of dressing animals. The little piggy is wearing a zip-up jacket, with a button up sweatshirt, and a shirt with snaps underneath. Three layers. If you want to work on clothing fasteners, but sitting at a table to for the duration of this task is just not going to be an effective way to complete this task, turn it into a game. During your setup, you hide the piggy’s jacket, sweatshirt, and shirt somewhere in the gym. Provide your kiddo with a set of visuals or give them hints describing each article of clothing. Have them run around the gym looking for the shirt, find the shirt, and start dressing the piggy, including its snaps. Next, bear crawl around until you locate the sweatshirt, don that sweatshirt, button it up, and now you’re ready to do the same with piggy’s outer jacket. Hop to it! In the end, you’re helping manage your child’s energy output, slow them down a bit, and help them to self-regulate. All the while addressing your fine motor fasteners goal! Kids love to be creative performers! Let your kiddo take center stage for this part of your session. Give them a handful of options (tailored toward the goals you’re already working toward) from which to choose, and have them teach you! If you’re working on upper body dressing, maybe a dressing item becomes a cape or a superhero outfit. Take this one, for example: if your kiddo has too much energy to sit and focus on scooping small items or you need to change up their sensory bin interactions to address their spoon-feeding goal, try having them scoop an ice cream sundae for you. Or maybe they like a TV show with animals. Have them pretend to be on the show and get the puppy chow ready in time for Spot’s entrance on the set! Maybe you’re working at a zoo and they have to go all over the room filling the food bowls for all the animals. You can even put a timer on the activity if you want, to add a little extra motivation for fun. Add gross motor components by having them bear crawl, snake slither, or bunny hop to obtain the food, and then walk carefully back to fill the food bowl. Be creative - remember they likely receive directions in a structured setting all day at school. By freshening things up for them during therapy, you may be helping to break up their day, by making this feel like a totally different experience. This is you! Some of my kids arrive at therapy with too much energy to start out on the obstacle course right away. Some need to start with a gross motor heavy routine in order to regulate their energy levels. Yet others arrive in need of completing the gross motor obstacle course free from structure, verbal instructions, or sequential requirements. With my kiddos in the last example, I see that they arrive with a lot of energy and that they benefit from completing gross motor or heavy work tasks, but that they become too overwhelmed when I provide verbal instructions for the obstacle course and may shut down (or get too revved up) as they feel the weight of more instructions given. I have found that it can be quite beneficial to allow them to (safely) complete their warm-up. Paying attention to their bodies and their seeking or avoiding patterns that day, I can gather some pretty beneficial information that I then use to help guide my session, following the lead of their energy and regulatory levels. Sessions may be: structured or unstructured, use a gross motor warm-up, or incorporate a preferred fine motor activity, provide my kiddo with directions, or allow them to create or choose their course, depending on their goals and needs! As with any part of OT, you should use your clinical reasoning skills to help guide your actions. 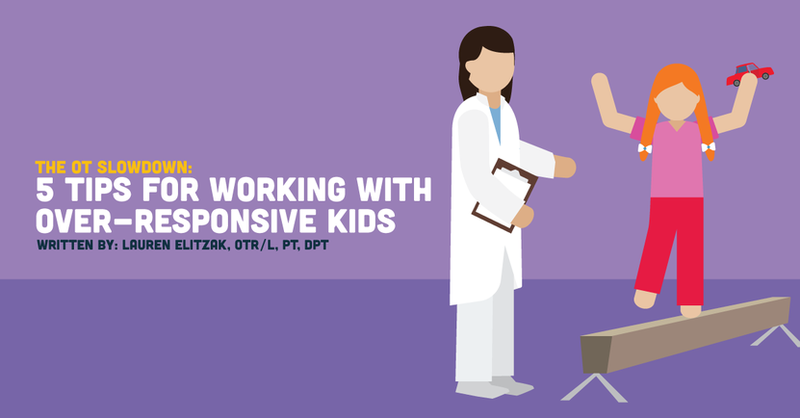 I use my clinical judgment to determine how to best run my session, tailored to the needs of each kiddo. Apply any combination of these 5 tips above to your sessions, and you can increase buy-in, up the fun, and gain your kiddos’ trust and attention!